(CNN) Notch this up to Swedes and another ridiculously cool, innovative design. This latest effort can be found off an African island and straightaway is placed high on that list of ‘amazing hotels I wish i could get to’ many travelers have. 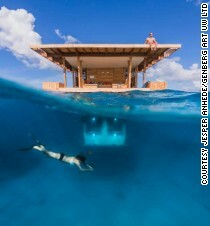 The new ‘digs’ opened for business this month, designed by Swedish company Genberg Underwater Hotels. At night, spotlights under the windows attract and illuminate squid and octopus — a more reclusive crowd than the daytime sea life. And you know… relaxation is good for your health. If you have the adventure gene, this one is for you.